I am a sucker for anything requiring less kitchen clean up post-meal. This quick and nutrition packed dinner does just that — saves me time preparing the meal and (added bonus) saves me time doing dishes afterward. Lemon chicken with a kick of spice has always been a meal I’ve truly enjoyed. Throughout high school and college, it was my go-to meal (when I wasn’t a vegetarian) to make on the fly after a busy day of dance/class/sorority events. It never fails to hit the spot. Another added bonus — it reheats perfectly the next day for a quick meal on-the-go. 1. Preheat large skillet or grill pan with 1 TBSP. oil of your choice; I used coconut oil. Add chicken breast tenders and cook for 5-8 minutes. Add chopped carrots. While carrots and chicken breast are cooking, chop red onion and rough chop the fresh chives. Add spice mixture (without the chives) to the top of each chicken breast. Squeeze lemon slice on top of individual chicken breasts then top breast meat with lemon wedge in pan. Add chopped onion. Continue allowing the chicken to cook the remaining time on side 1. 2. After 5-8 minutes has elapsed, remove lemon wedges from chicken breast and flip them. Add fresh chives at this point. Top this side of chicken breast with spice mixture and previously removed lemon wedges. Allow to cook approximately 5 minutes or until thoroughly cooked through. Then, remove from heat, serve and enjoy! 3. 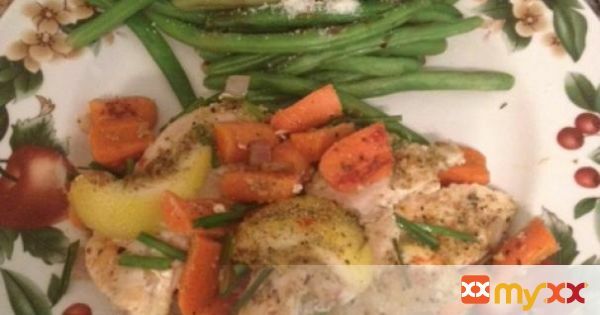 I typically pair this recipe with a steamed green veggies like green beans, broccoli, kale/spinach, etc. It makes for a wonderful healthy and filling meal that’s perfect after a long run or HIIT workout.